The concept for operations of the V2 rocket troops would be as simple as possible, considering that there would be hundreds of troops and specialized vehicles involved. 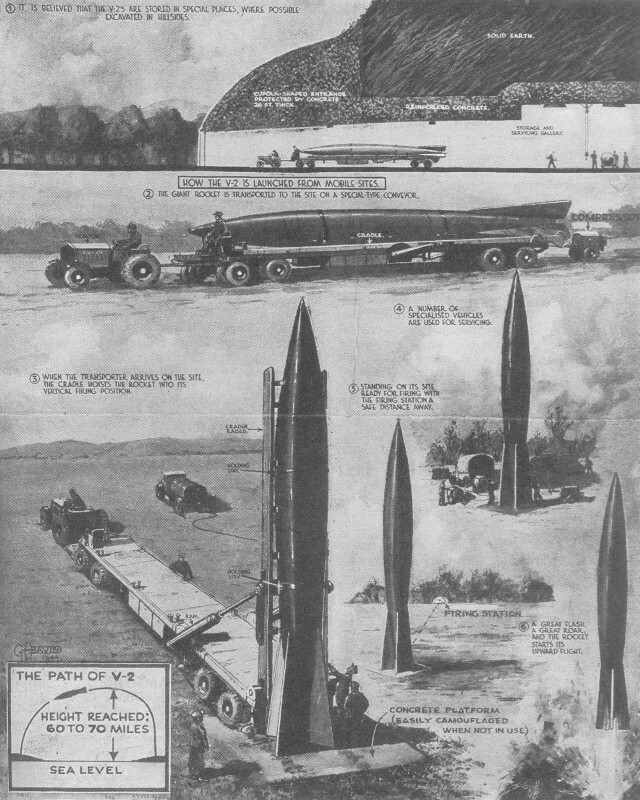 A typical trailer mounted rocket was supported by about thirty vehicles, which included a transportation trailer, mobile crane, launch table trailer, propellant vehicles, and command and control trucks. The rockets, along with the liquid-oxygen and alcohol, would be delivered to the firing areas by railroad. The warheads would be delivered via truck. By summer of 1944, SS General Hans Kammler had gained full control of production and deployment of the V2 missiles. General Dornberger was given the assignment of training the first mobile field troops that would assemble and launch the rockets. Two operational troops were formed: Gruppe Nord (north), Gruppe Süd (south) - each consisting of several technical and firing batteries. The deployment of the missile to it's mobile firing sites, during it's limited months of actual operations against Allied targets, was certainly not an easy task - but it was a task that the Germans performed quite efficiently. The multitude of troops required seemed to be the single biggest drawback. Because of Allied air superiority, V2s were launched from easily concealed areas - such as the wooded areas of Den Haag (The Hague). The concentration of troops preparing a V2 for launch would be a great temptation to any Allied fighter looking for ground targets. A Typical V2 Batterie consisted of (5) platoons. All platoons also carried the usual weapons of a combat unit and the normal equipment associated with their duties. Headquarters Group: Unit administration and command communication. Launching Group: Included (3) firing units, each of the three having (1) Bodenplatte and (1) Feuerleitpanzer. There were (3) Meillerwagens per each unit - so, a total of (9) Meillerwagens per platoon. Radio Group: Normal group communications, the calculating of the launch site, Brennschluss and Leitstrahlstellung (guide beam). Technical Group: Unloaded rockets, minus warheads, from the rail cars that carried them to the operational areas. Moved the rockets to the field stores. Tested and prepared them for the launching platoon. The technical troop would use about (3) Vidalwagens for each Meillerwagen - so, a V2 batteries technical troop would have approximately 27 Vidalwagens. 1st unit handled the supply of liquid oxygen from railhead to firing site. 2nd unit handled the supply of alcohol from railhead to firing site. 3rd unit handled the supply of warheads and sodium permanganate to the field stores. The rockets (normally 20 per shipment) were transported to the general firing areas by rail where they were met by a supply detachment of the technical troop. This was made up of about 100 cars, 62 tractors, 33 dispatch riders, some 22 Betriebstoffanhaenger liquid oxygen tankers, 2 Strabo-cranes, 48 Opel Blitz alcohol tankers, 4 hydrogen peroxide tankers, 4 towed pump trailers, with the sodium permanganate (z-stoff) off loaded in barrels. A field store could secure and store many rockets, but this was not desirable - the rockets needed to be fired almost immediately. These troops would receive the rocket and prepare it for transfer to the firing troops. Tests performed at the field stores included: checks of the propulsion systems, steering, alcohol tank pressurization, wiring and to make each rocket ready for the internal power source. Any problems that could not be repaired at the field stores, meant that the rockets would have to be returned to the Mittelwerk. The technical personnel would also attach the warheads to the rockets. The one-ton warheads were delivered in special drums that had to be hoisted into place and secured to the tip of the rocket. The technical troops also had to tow a giant mobile crane from the railhead to the transfer point so that the four-ton rocket (unfueled) could be lifted and transferred to the firing crew's Meillerwagen transport/launch trailer. The Meillerwagen was fitted with two large clamps that gripped the V2 around the airframe above the fins and also around the warhead. The launching platoon was divided into three units of 39 men each. Each 39 man firing crew were assigned one of the following duties: (1) The fire control crew with the Feuerleitpanzer fire-control vehicle; (2) The surveying and adjustment crew; (3) The engine crew; (4) The electrical crew; (5) The vehicle crew with the Meillerwagen and firing table. The firing crews would then proceed to the launch site and place the towed launching table into position. Once the legs of the launch table were extended, the table was raised enough for the towing dolly to be removed. The 3600 lb. launching table (Abschussplattform) was made from welded steel and was, in itself, very ingenious. It was relatively small and portable considering the size of the V2. The launching crew next would back the Meillerwagen up to the launching table and raise the rocket into position on the table. The V2 was now ready for fueling. A number of tests were also performed, including a "dry" purge of the fuel tanks with compressed nitrogen to locate any leaks. The rocket had to be fueled in the vertical position because the fuel tanks inside of the V2 were designed to withstand the weight of the fuel in the upright position only. The fueling trucks and trailers would then approach the rocket. These consisted of two alcohol supply vehicles, one pump, and a towed liquid oxygen vehicle. Hydrogen peroxide was also required. This array of support vehicles around the rocket could also be a tempting target for prowling Allied fighters. The launching crews first filled the V2 with alcohol, then liquid oxygen. The hoses and clamps soon were covered in frost from the super-cool liquid oxygen. The frost from the liquid oxygen can be seen in most launch photos from the period as a band of white appearing around the body of the rocket, just above the fins. Electrical power for the V-2 was provided by ground sources when it rested on the launching platform and by batteries while in flight. Ground power was necessary for launch preparations, including the firing system. When possible, the troops would use local municipal electrical power sources. The arm of the Meillerwagen was lowered after the fueling was completed. The V2 was then oriented to its exact firing position by using a dial-sight incorporated into the launching table. The firing troops then would install the electrical igniter into the combustion chamber. After all personnel and vehicles were cleared from the launching site, the troop commander would enter the firing control vehicle. It was from this armored vehicle that the final remote tests of the steering controls were completed. The troop commander then at some point would give the order to launch the V2. The liquid oxygen and alcohol then flowed by gravity to the exhaust nozzle, where they were lit by the igniter, which resembled a pinwheel, sparking as it rotated. This 8-ton burning in itself was not sufficient to launch the rocket, but it did give the control officer a visual indication that the rocket was burning properly. Once the launch control officer believed the rocket was ready to fire, an electric command was sent to start the fuel pumps. The fuel pump steam turbine reached full speed, the fuel flow reached its full value of 275 pounds-per-second and the engine thrust reached about 69,000 pounds. After the rocket was away, the firing crews would swiftly depart from the area. The A4/V2 rocket had an operational range of 234 miles. The max. burning time of the engine was 65-70 seconds, shortly before engine shutdown the A4 weighed 4040 kg at a height of 35 km, starting with 1 G force, and at shutdown 8 G, after shutdown the A4 flew to a height of 97 km and fell to earth with a impact speed of 3240-3600 km per hour, at shutdown the angle was approximately 40-45 degrees. The angle immediately after liftoff was 90 degrees; 30 seconds after launch it reached speed of sound. When launched against targets close to the operational range of the vehicle, the deviation between target and impact was normally 4 to 11 miles (7-17 km away from target). This made the rocket only suitable for use against widely populated areas. At shorter targeting ranges, the accuracy of the A4 was improved. The Leitstrahl-device was a "guiding beam" that improved accuracy of the A4 somewhat during the later days of the campaign. Less than one quarter of all A4 rockets were guided with the Leitstrahlstellung. A description of an A4/V2 impact would be as follows. First, a whip cracking sound of a blast wave created by the rocket (moving faster than the speed of sound) bounces off of the point of impact just split seconds before the flash of impact. This was followed by the chaos of the explosion with debris and earth churned skyward. Soon, the whine and rush of whistling air as the sound catches up with the rocket followed by a deafening roar of the incoming rocket, which tapers off to silence. There could be no warning. The A4/V2 impacted at 3 times the speed of sound. It is clear that the V2, as a weapon of warfare, could not have turned the tide of war for Germany in 1944-45. Only if the weapon had been operational 2-3 years earlier, might have the Allied invasion been prevented by tens-of-thousands of A4/V2 missiles raining on English ports. Since the V2 was not operational until late 1944, the countless funds, materials, and manpower could have been better used to produce more planes and tanks. It was purely a "Vengeance Weapon", but there was no countermeasure that could stop it. The logistics that were required to launch thousands of V2s, in the later stages of the war, make the subject very interesting. On order of the Führer, SS chief Himmler was given the task of A4/V2 deployment. He, in turn, ordered that SS Gruppenführer Hans Kammler would take command on Aug. 31, 1944 over the rocket troops. On September 6, 1944, SS Gruppenführer Kammler gave order 1, which was; there will be a Gruppe Nord (Group North) and a Gruppe Süd (Group South.) Each Gruppe consisted of about 5306 personnel and 1592 vehicles. 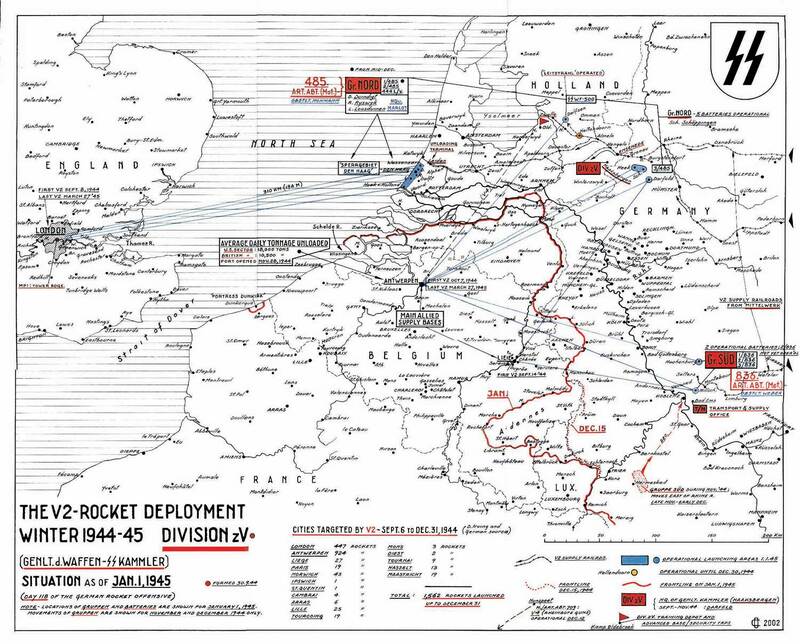 The rocket units were already concentrated in the Baumholder training area, 28 miles southwest of Trier, and they were immediately organized for fast deployment. The original place of operations for Group North was Kleve (place in Germany close to the Dutch border near the city of Nijmegen) and for Group South was Euskirchen (Germany). All units were under direct command of SS General Hans Kammler. The division z. V. (zur Vergeltung = LXV Infantry Corps for Special Employment), was strictly designated was for A4/V2 operations.